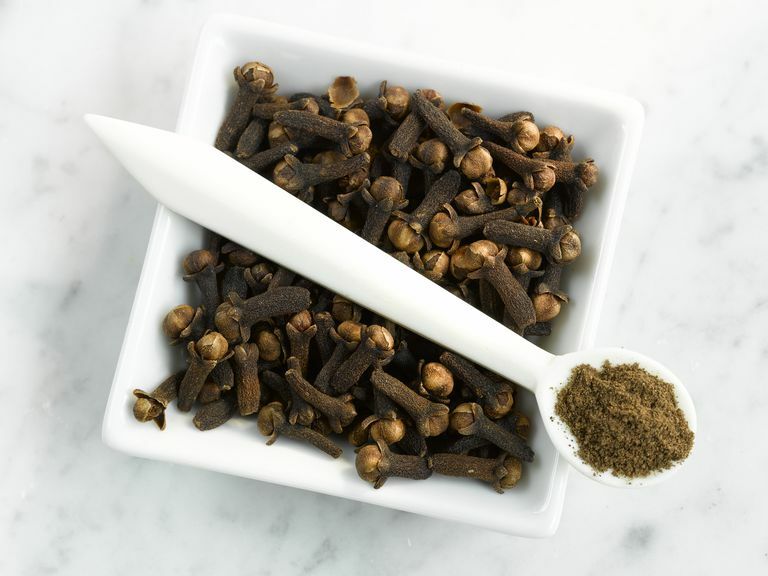 Sourced from an evergreen tree that grows in Asia and South America, cloves are a spice used in cooking and are also said to offer several health benefits. The tree's leaves, flower buds, and fruit are used to produce clove oil, which is widely used in aromatherapy. In Germany, a governmental regulatory agency known as the Commission E has approved clove for use as a topical antiseptic and anesthetic. However, research on clove's health benefits is limited. Clove oil is perhaps best known as a remedy for a toothache and dental pain, however, scientific support for its effects on tooth pain is very limited so far. In a 2006 study of 73 adults, for instance, researchers found that clove-based gel was comparable to benzocaine (a local anesthetic) in its ability to ease pain resulting from injections in the mouth. Although clove oil is sometimes touted as a remedy to fight off dental plaque and tooth decay, a laboratory study published in Acta Bio-medica in 2011 found that it may not be as effective as cinnamon oil. The study compared the effect of cinnamon oil and clove oil on the oral bacteria Streptococcus mutans and found that cinnamon was more effective than clove oil in inhibiting the bacteria. Although tea tree oil (an essential oil used in aromatherapy) is better known as a natural spot treatment for acne, clove oil is sometimes used for pimples. While there are no clinical studies supporting these claims, the oil's antiseptic, antimicrobial properties may help kill P. acnes, the skin-dwelling bacteria involved in the development of acne. In lab tests published in 2009, scientists found that clove bud oil (as well as essential oils of cinnamon and allspice) may help protect against food poisoning. After adding clove oil to an edible apple puree, the scientists observed that clove bud oil helped suppress the growth of listeria (a type of bacteria known to cause food-borne illness). Cloves may cause allergic reactions and certain adverse effects (such as a burning sensation, increased risk of bleeding and lowered blood sugar levels) in some individuals. Ingesting essential oils (or using excess amounts on the surface of the body) is generally not recommended due to toxicity concerns, even with very small amounts. There have been case reports of serious adverse effects (such as disseminated intravascular coagulation (DIC), hepatocellular necrosis, central nervous system depression, urinary abnormalities and a large anion-gap acidosis after the ingestion of clove oil by an infant and child. If you're interested in using clove oil, make sure to consult your healthcare provider first to weigh the pros and cons and to discuss whether it's right for you. Alqareer A, Alyahya A, Andersson L. The effect of clove and benzocaine versus placebo as topical anesthetics. J Dent. 2006 34(10):747-50. Du WX, Olsen CW, Avena-Bustillos RJ, McHugh TH, Levin CE, Friedman M. Effects of allspice, cinnamon, and clove bud essential oils in edible apple films on physical properties and antimicrobial activities. J Food Sci. 2009 74(7):M372-8. Gupta C, Kumari A, Garg AP, Catanzaro R, Marotta F. Comparative study of cinnamon oil and clove oil on some oral microbiota. Acta Biomed. 2011 Dec;82(3):197-9. Sharma R, Kishore N, Hussein A, Lall N. Antibacterial and anti-inflammatory effects of Syzygium jambos L. (Alston) and isolated compounds on acne vulgaris. BMC Complement Altern Med. 2013 Oct 29;13:292. doi: 10.1186/1472-6882-13-292. Can Peppermint Oil Soothe Digestive Troubles? Can Celery Seed Keep Your Blood Pressure in Check? The Benefits of Pu-erh Tea: Should You Try It? Can Mulungu Bark Extract Really Help Relieve Anxiety?